Who are your competitors in organic search results? Ever wonder if there is a way to use more data or information besides what’s in your head to find your competitors? With so many online tools at our disposal, the simple answer is yes, and I’ll show you how to find your competitors and how to outrank them in search results. First of all, competitors are often very different players when it comes to online vs. offline. For example, when you think of your competitors for let’s say TOMS Shoes as an example, you may think of other similar shoes or other companies with strong give-back programs. 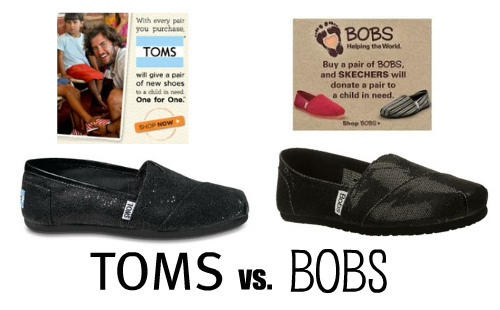 A competitor that comes to mind immediately is BOBS Shoes (a TOMS knockoff). 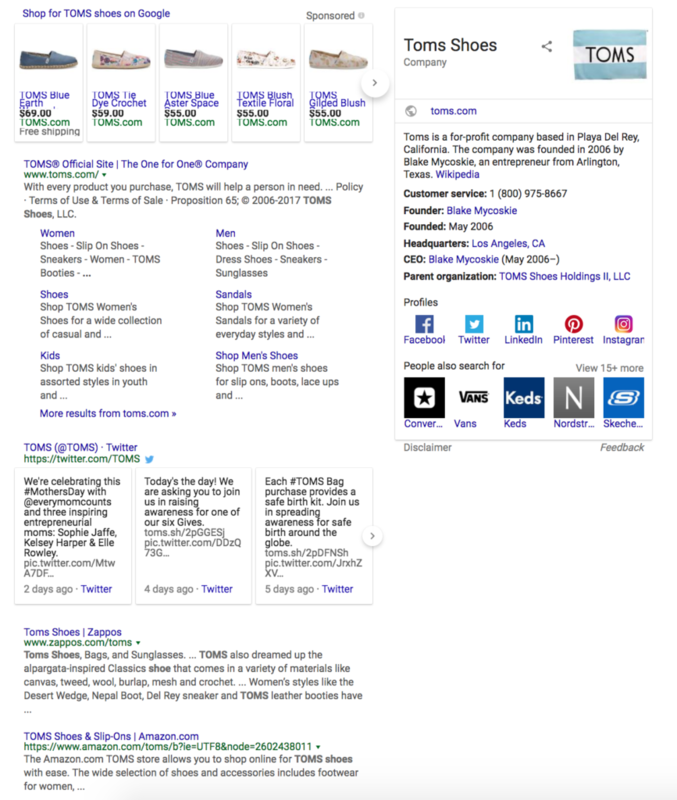 While TOMS is probably very happy to see Zappos, Amazon, Nordstrom, and even shopping results appear- ultimately they are competing with those sites and stores when it comes to online sales, and not necessarily BOBS. Now this was a brand search term example to make things simpler, but what about non-brand phrases? Determine your target keywords if you haven’t already. I like to create shortlist 10-20 terms that range from tough to rank for to attainable to rank for. Search for each phrase and look through the results, as you do this, take note of websites you see appearing for several of your search phrases. Take the list of sites that appeared in search results and spend time looking through their offering to see if it’s actually competitive with your site- if not, you may need to refine your search terms further to be more relevant. I like to use Moz Toolbar, a free Chrome plugin, that lets me easily see the Domain Authority of each page in search results. Domain Authority is a score that indicates how credible/powerful a domain, or website, is in search results that influences how that competitor will rank. Once I can see the Domain Authority, I like to compare that to my site to determine which sites I may be able to displace in search results. Some tools to make this process easier, some that I like to use in combination with the old-school search and analyze method are SpyFu and SEMRush. Experience: Take a look around- how’s the quality, the experience, the site load time? Is it easy to use and navigate? Easy to purchase and convert? Content: I start my content analysis by going to Google and typing in a site colon search with a competitor’s URL, for example: site:example.com. This shows you how many pages and what types of content Google has in it’s index for my competitors. If there are thousands of pages on a competing website, but I only have ten on mine I know that I’ve probably got a long road ahead to beat that site, because they likely have quality content since they are ranking well. I look through the content my competitors have to figure out where they may have coverage that I don’t, where they don’t have coverage that I can fill a gap for, and the overall quality and style of their content. Bottom line, they are doing something right and I’m trying to figure out what that is and how I can do it better… after all, if my site deserves top rankings I should be doing something better than who is already there. External Popularity: Are people and websites talking about this competitor more than you? Using tools like Moz’s Open Site Explorer or Buzzsumo, I can determine where competitors have quality backlinks (aka who is talking about them/linking back to their website). Finding quality websites that want to link to you is definitely tough, but if a competitor has already found some that you are relevant for, why not reach out and make a new connection? And how can you beat them? I’ll go more in depth on the “how” part in another blog post, but for now you probably have a solid day of analysis ahead of you.